I have decided to do something new this school year and share with all of you twelve teaching tips from Mr. Terupt. You can check out Mr. Terupt’s Teaching Tip #1: Getting Your Students to Revise at rhteacherslibrarians.com. Going forward, starting in August, you will find new Mr. Terupt’s Teaching Tips right here, on the first Monday of every month. Once in a while, I might be inspired by Mr. Terupt’s Teaching Tips to share with you some of my own strategies, as you will see in my next post, inspired by Mr. Terupt’s Teaching Tip #1! I hope that you find these tips helpful, and have a fun and successful school year. In the meantime, enjoy your summer! While working on Mr. Terupt’s first tip, I was prompted to think about my revision process. 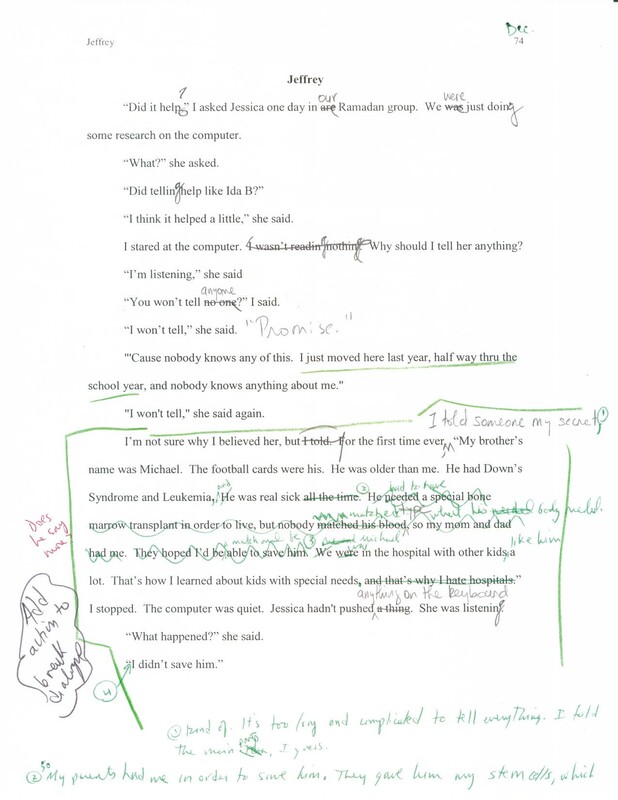 Below is a peek at what revising looks like for me and a few of my strategies. Who knows? Maybe you will find a new mini-lesson or two here. Reread what I’ve written. Make changes. Reread it again. Make more changes. Reread it again! Make more changes! Steps 1-3 happen over and over and over. But what do I focus on while I read, and what prompts me to make changes? Sometimes I read my writing aloud to myself. Hearing it can help me with word choice, punctuation, dialogue, and more. I reread with a specific focus or goal in mind. For example, I might reread to eliminate where I’ve been redundant. With a cast of characters such as the one I feature in my Mr. Terupt novels, I have to work hard to make sure two different voices aren’t using the same phrases or repeating things or describing something in the same way. I need the voices to be distinct. I might highlight and/or color code specific areas. While working on my Mr. Terupt novels I made the critical details for each character a different color. I was able to read just the purple parts from beginning to end to make sure that I had developed that part of the manuscript, that I wasn’t repeating, and that there weren’t gaps. This was so helpful! I use numbers to track where I want to insert changes and add sentences, with a list corresponding to those numbers on a separate sheet of paper or in the margins of my draft. I jot notes in the margins to remind myself of what I want to think about when I revisit that page later. I jot questions in the margins to help me focus as I move forward in the manuscript. After all this, it is time to share so that I get feedback and hear questions, and this will help me do it all over again. Be sure to visit rhteacherslibrarians.com to find Mr. Terupt’s Teaching Tip #1, and check back here on the first Monday in August to discover what’s next.